The modern urban lifestyle, as many other aspects of London city living, evolves at tremendous pace, and with it, so do the aesthetic avenues which create trends by sheer momentum. 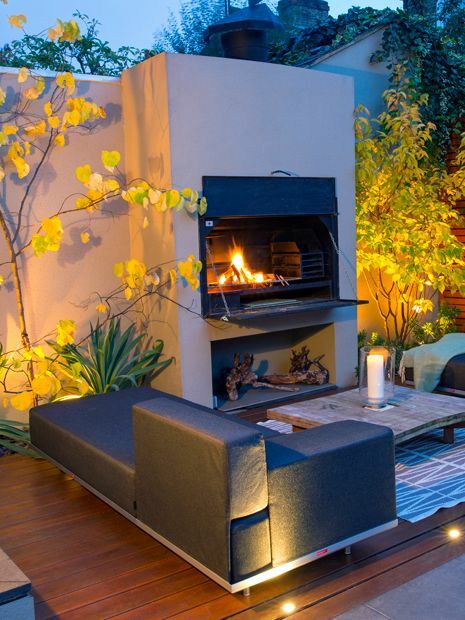 From green walls to outdoor fire pits, kitchens, artificial grass, planters and agendas of wildlife well-being, native plants and low maintenance, we need to refresh how we approach the design of our gardens and roof terraces every so often. Likewise, we ought to reassess environmental impact, extend and develop our urban ways of life into sustainable outdoor spaces. 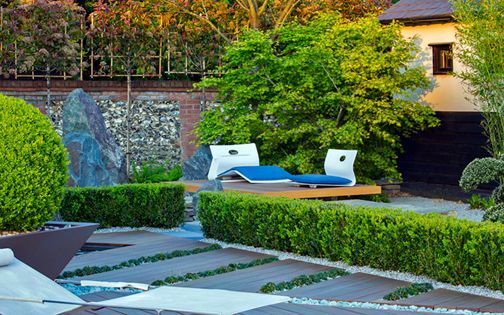 Personally, I follow intuition and experience when planning the vision for a new project – inspired by the unique locations and diverse clients of our garden design practice in London. This intimate Clapham Town back garden forms seamless fluidity with the residence, not only in flawless surfaces and unique furniture, but also in lighting ambience, multifunctionality and warmth of a built-in outdoor fireplace. The central cooking and heating feature enhances focus on the social, alfresco aspect of the garden, where everybody gathers to gaze at the flames, cook and relax on snug sofas. This low maintenance, innovative approach promotes year-round garden use, producing a resourceful hub, as well as a captivating focal point. With such an expansive city panorama, the exclusive position of this glass and steel dining set defines an ultimate bird's-eye view through easy-care roof terrace seating. 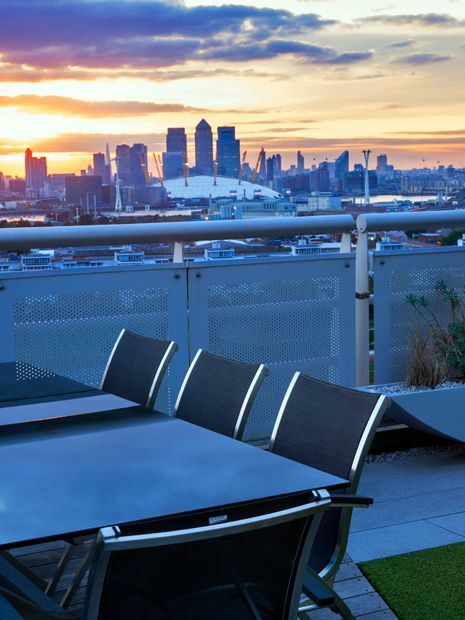 This Thames Barrier penthouse terrace benefits from an inspiring London vista and the phenomenal sunsets which accompany it – extended further within sleek glass reflections. The dining set's materials are clean, easy-to-use and readily au fait with the prevailing weather patterns in this polluted, yet enthralling, high-reaching part of the capital by the riverbanks of Royal Docks. 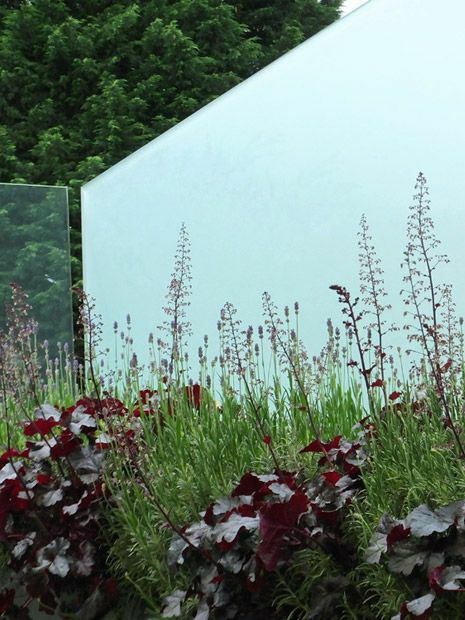 While you'd expect such colossal pots in a minimalist town garden, their structure and layout achieve refined purpose in a countryside setting too. This trio of white conical vessels has emerged from our London garden design portfolio to portray renewed definition for a barn conversion in the middle of an Essex field. 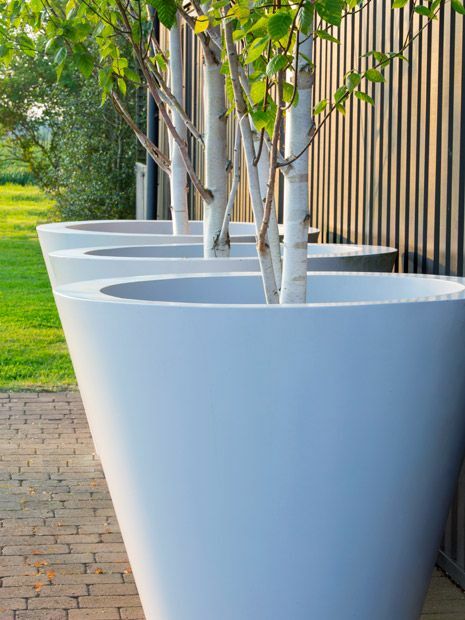 The alabaster trunks of Silver birch trees enhance pivotal scale amid gleaming luminosity and sheer contrast, where a tall facade behind the pots is sensitively balanced, while dainty foliage merges with verdant country fields. What can we do to conserve precious privacy in a densely packed London neighbourhood, yet still sustain abundant daylight? Install a sheet of frameless glass screen! The silky backdrop accentuates foliar textures, while silhouettes generated via outdoor lighting produce a contemporary rooftop ambience, amplified when backlit by sunlight. 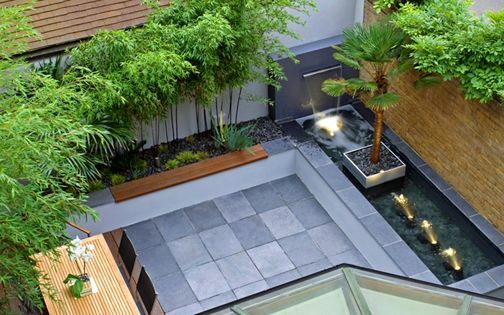 This minimalist urban terrace approach maintains an effective, low upkeep setting in a North London Southgate roof garden, providing a radiant, safe environment – augmented by durable construction. 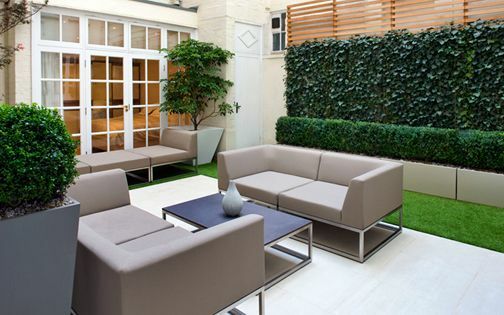 The back garden of this modern Highbury townhouse was brimming with a plethora of landscaping materials and plants – remnants of a developer's effort to embellish the outdoor space. At times, a blank canvas is preferable, yet in this project, the choice was entirely ours in opting to retain the valuable mature flora, where established Palm trees have grown considerably for several years and were undoubtedly worth keeping. To define a new, original setting, albeit perceived as if intended at the outset, we curved a bespoke, built-in, powder-coated steel bench around the towering torso of a New Zealand Palm tree. 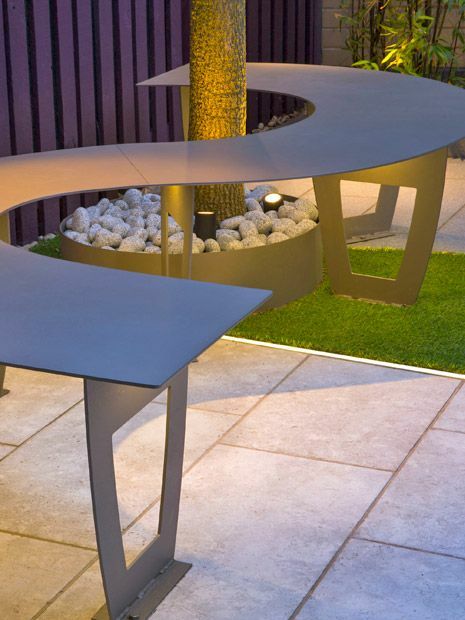 The seat's streamlined, slim profile floats elegantly, while LED lighting emits a warm afterglow below the bench, renewing the nightscape of this North London garden with an invigorating, illuminated display. 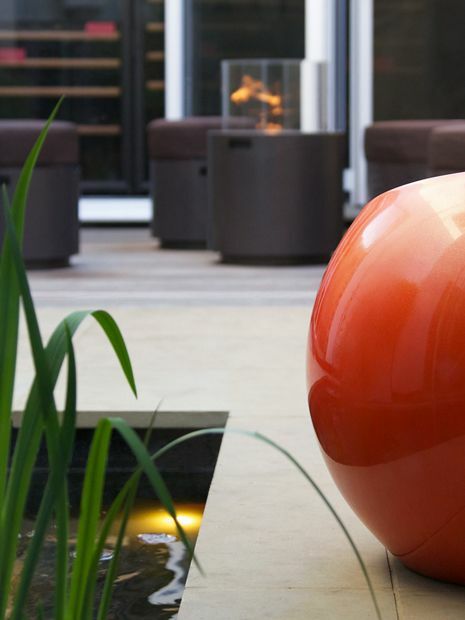 We developed a brand-new planter for this chic rooftop terrace, remarkably positioned by Millennium Bridge, and with segments of the building's elevations clad in orange hues, enveloped by a glass balustrade, we designed a floating bespoke container to produce congruous elements. 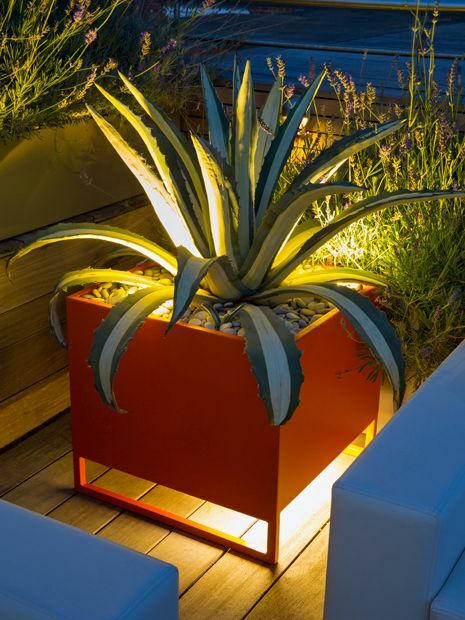 The planter is elevated from the deck, readily mounted by its slim lower frame, where an LED light glows below a sculptural Agave succulent. Featured among English lavenders, the vibrant composition is repeated in diagonal corners across this lush, intimate riverside terrace, displaying distinctive focal points amid a rooftop abundant in Mediterranean, architectural design nuances. 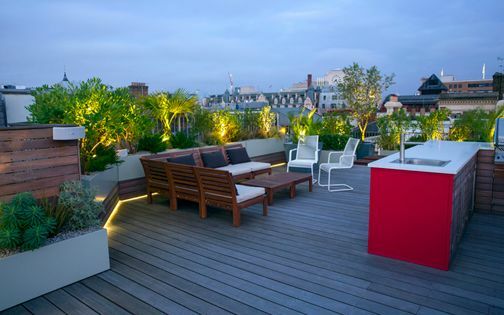 Cooking outdoors forms a pivotal part of our clients' life in Covent Garden, where their large roof garden elevates alfresco dining to new heights. 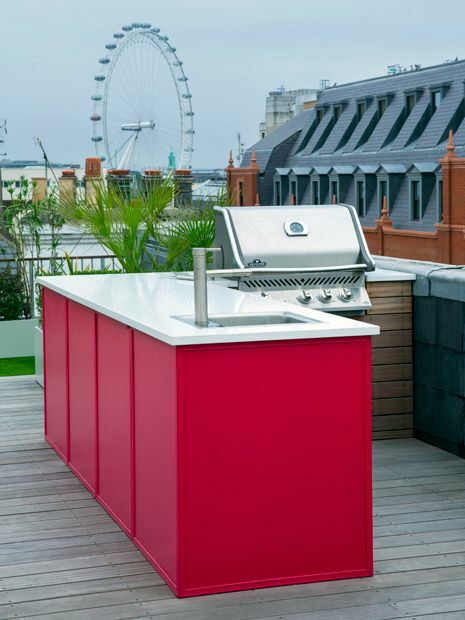 We designed a 3.5-metre long outdoor kitchen island at an L-shape, integrating a grill, sink and cabinets. Hued in a deep crimson tint, and finished in a white Corian worktop, this cooking hub defines a central vantage point atop the main entertainment deck. Large get-togethers of family and friends perch comfortably among expansive seating areas to enjoy the majestic vista of a spinning London Eye with easygoing, and rather convenient, garden design luxury. 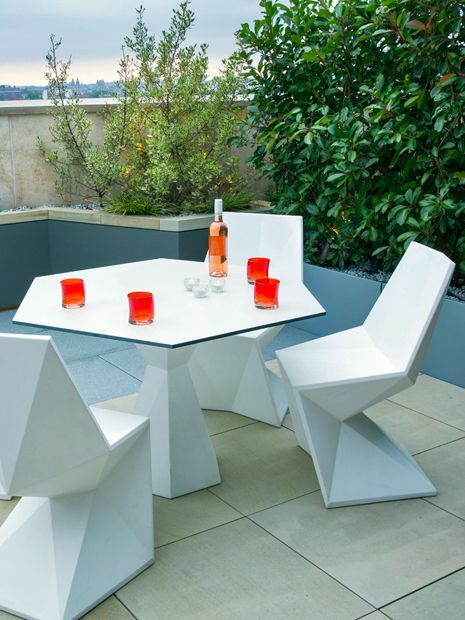 The pure white geometric furniture set in this Pimlico rooftop terrace complements the tones of limestone cladding and sandstone pavers. The seats' architectonic forms are softened by the round outlines of Eucalypt, Mexican lilies and Lavenders, while the lightweight chairs and table are weighted with sand in their bases, sustaining trouble-free use in gusty wind. 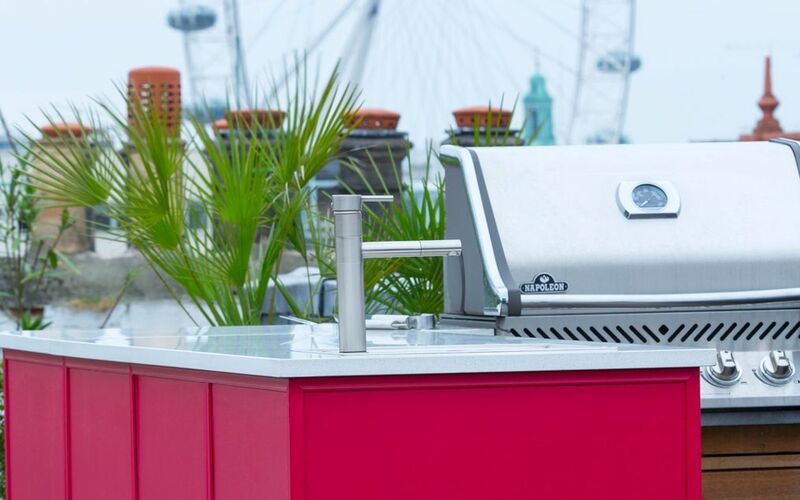 Easily maintained, the innovative Vondom furniture contributes to an effortless outdoor experience, enabling more time to enjoy the inspiring panoramas of Battersea Power Station, Chelsea Embankment and Wembley Stadium, while aptly perfecting a roof garden makeover with its lustrous patina. Outdoor sculptures are as timeless as the gardens which display them, yet the forms, genres, materials and methods to present their qualities have evolved distinctly. 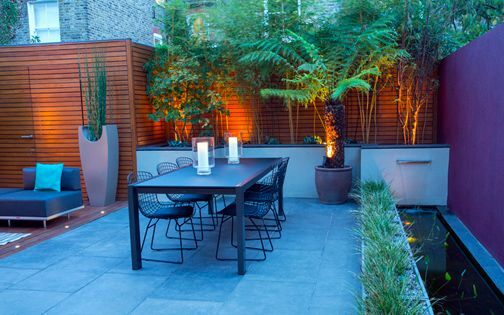 Here, in Clapham Town, we selected a deep maroon tint for the rendered water feature wall to provide a warm backdrop for a weathered steel sculpture, and elevate a modern garden remake. 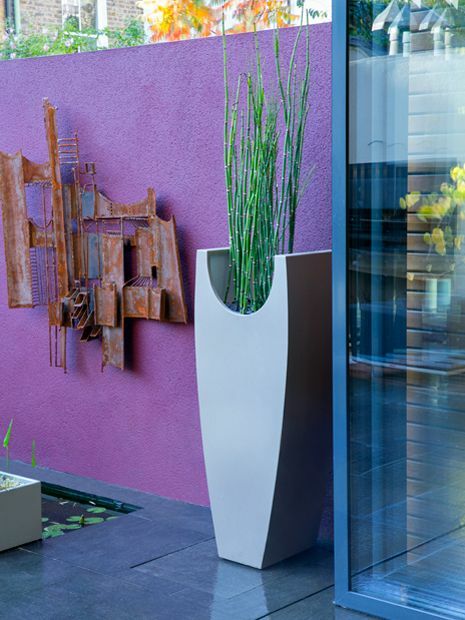 To contrast the overall linear layout of the space, we designed a tall curved vase planted with Horsetails which perfectly complements contemporary courtyard garden ideas, and completes an intimate, highly personal vignette for an art aficionado client. 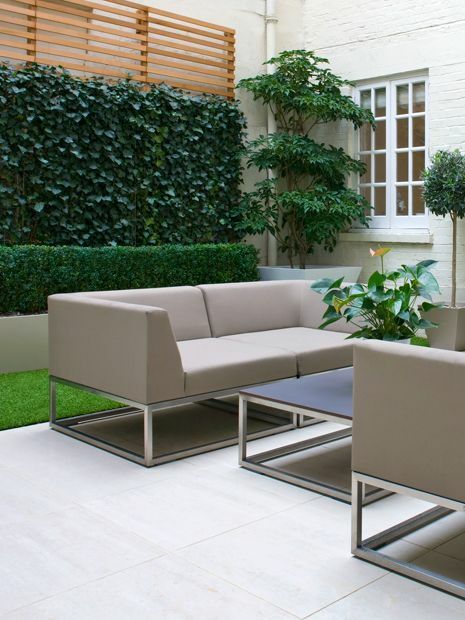 Not all outdoor walls are made equal, and in this Wapping terrace garden design, the living room's facade was enhanced by a vigorous veil of heavenly scented evergreen Jasmine climbers. 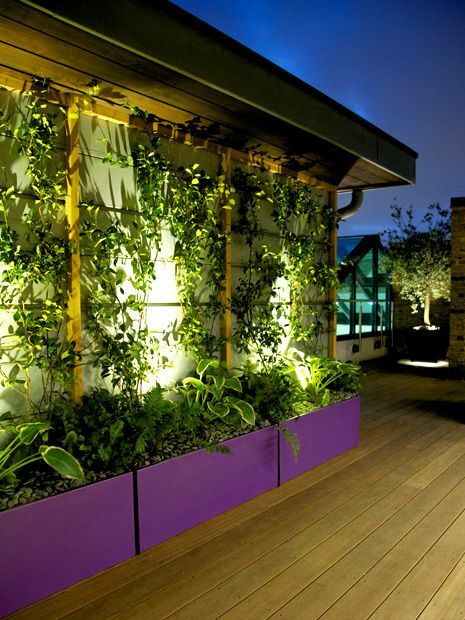 Detailed with a Western red cedar frame, purple troughs, Ferns, grasses and rooftop lighting, this green wall was transformed into a discrete centrepiece. In such an urban river environment, the naturalistic layer of durable foliage forms vitally thriving roof terrace garden verdancy. 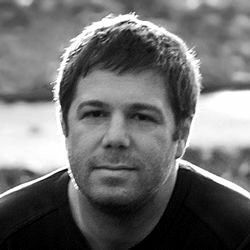 Well-designed outdoor spaces form organic, inseparable extensions of our home lives, and truly represent who we are, how we think, our aspirations and top priorities. 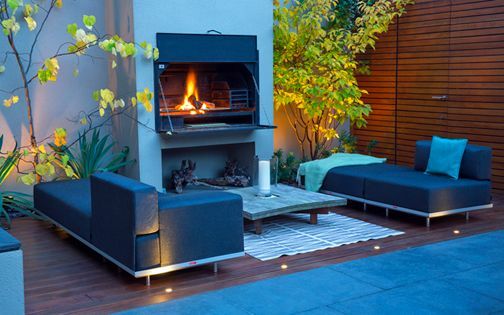 Whether we keep abreast of the latest garden gizmos, outdoor gadgets, design trends or fashionable garden styles, an intimate city garden or roof terrace should naturally make us feel comfortable, proud and ready to engage friends and family in these personal spaces, whatever the weather or time of year. So I ask you – what's your most delectable garden vogue?